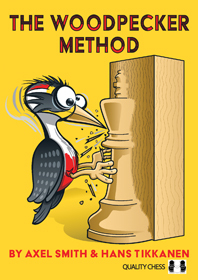 Welcome to the latest Woodpecker Method training blog. It feels strange to say that the training program is approaching its end when I am only up to my third cycle, but the ever-shortening time limits mean that there is, indeed, not much time remaining. First, let me recap my results from previous cycles, using a set of 984 exercises. I finished my second cycle on the night of Wednesday the 5th. After taking a look ahead at the number of days before the Olympiad, I decided to bend one of the ‘rules’ of the method, and avoided taking a rest day before starting my third cycle. I wouldn’t normally have skipped the rest day, but if I followed the exact schedule of training days and rest days as prescribed in the book, I would have had to solve 984 exercises in the morning before the first round of the Olympiad! Despite making that change to save myself a day, the prospect of burnout and insufficient recovery time was still weighing on my mind these past few days. To solve 984 exercises in a day, then plunge straight into a high-level event the very next day, seemed to be asking for trouble. I asked Axel and Hans about their experiences of training with the Woodpecker Method and how much rest they felt was optimal after completing the program before playing a tournament. They basically said that it will vary from person to person and that I should be able to gauge my own limits and energy reserves; but they also both said that they (unsurprisingly) felt tired after completing the final cycle in a day, and they both took at least a few rest days before playing a tournament. I am delighted with those numbers: my accuracy has improved significantly in the third cycle while my speed has jumped through the roof. In percentage terms, I’ve chopped nearly 45% off my time from the second cycle and eliminated almost 80% of the errors. I’m pleasantly surprised as I guessed it might be a case of diminishing returns with each cycle, but in proportional terms I’ve had the opposite experience. Let me conclude by saying “Don’t try this at home, kids!” In other words, I am making these changes due to a tight schedule and the need for a decent recovery period before a tough competition. If it were not for these circumstances, I would stick to the plan advocated in the book – and you should too. How has everyone else been doing this week? I’ve completed 8/14 days in cycle 2 – 654 problems in 630 minutes with 93% accuracy. Wow, those are indeed great results! Did you still write down the complete answers in the third cycle, or just the first moves or none at all? In case you didn’t write down anything, I wonder how you remember whether you had really the right answer and didn’t miss something? I’m curious about this myself! The answer will be revealed in my final Woodpecker blog post next Wednesday. I wrote a brief solution for every exercise. In the great majority of them, I wrote the first move and nothing else, as by now the supporting variations are pretty clear in my head when I check the solutions. However, for the tricky exercises where I’d missed something important in previous cycles, I made a point of writing a bit more, making sure to write down the key move which I’d missed in previous attempts. A question that popped to mind earlier today. I’ve been using GM Aagaard’s recommendation of memorizing the main lines in opening books by switching the Training feature on with Chessbase and predicting the next move in my repertoire. A Black vs 1.d4 repertoire recently took me two weeks to complete, roughly one chapter a day. Would a woodpecker (Hold on…is this a decent start to a potential tongue twister? Making a mental note…) type method potentially be a good idea for memorizing one’s opening repertoire? It might make digesting a completed Negi 1.e4 repertoire (for example) easier. On the other hand, 6-7 cycles of this seems like possible overkill. Well done for putting in a good effort so far. Your speed may not be as high as some others but remember that the only competition is with yourself, when you come back and improve on later cycles. Also a couple of things weren’t clear: you say you started your first cycle today, but at the end of the post you say you’ve spent four days so far. Also you mention solving from the book, but then say you spent a week inputting the positions to avoid solving from the book. I’m sure that repetitive ‘solving’ of one’s opening repertoire would aid memorization of it. However, I would have thought the immense time and effort needed could be used more productively in training another skill such as tactics, endgames or positional play. Not to mention that repertoires must constantly evolve due to new analysis/novelties. It also depends on how sharp your repertoire is though. If you play a ton of forcing main lines then clearly you will have to memorize a lot more than someone who goes for a more closed game. So maybe the method could be applied selectively. For instance, if you play the Najdorf Poisoned Pawn, there will no doubt be some crazy tactical lines where everything has been worked out precisely to a forced draw. If someone plays it and you forget your lines, you lose by force. So for lines like that, absolutely, do whatever it takes to drill them into your mind as thoroughly as possible. But for less forcing stuff, where the cost of playing a second-best move is not so high, I think the effort could be better applied to another part of one’s game. It’s been quite a long time since we heard anything about upcoming books. Thanks for clarifying. So if I understand correctly, you made a massive ChessBase file with all the games and solutions, and are now solving from that. Nothing wrong with doing that if you find it works for you – but did you consider getting the Forward Chess version instead? Anyway, I’m glad to hear you are now working through the exercises. I’m pretty sure everyone misses some silly things the first time round (I know I did!) but keep track of your score and I’m sure you’ll see a big improvement in later cycles. To my own surprise the third cycle for my set of 510 exercises went very smooth and I was able to finish on schedule within a week. I needed 8 hours in total and scored 99% this time. I saw or remembered all of the solutions but missed some sideline here and there. For the fourth cycle I think it´s important to avoid getting sloppy and still calculate as accurately as possible. I don´t believe that I can accelerate the process of calculating accurately, writing down at least the first move of my solution and comparing the results by much. So for my 4th cycle I will prpbably have to spend two hours each day on solving after work. Sounds tough but possible to me. Unfortunately I haven’t had the time yet to start with my third cycle (the team competition started last saturday), so I had half a week break. I am planning to do this cycle next Friday. I hope I can finish it in one day (I have the whole day available). Well done for finishing the third cycle and improving your numbers. It’s good that you are mentally prepared to spend two hours each evening in your fourth cycle – but I would not be at all surprised if you manage to knock another hour or two off your total solving time. Well done to you too for completing three cycles and improving results. If you don’t have time to attempt all exercises in a single day, then what about a fifth cycle over two days? I’d suggest re-evaluating your plans after completing your fourth cycle, taking into account any further improvements in your speed. You don’t mean the entire set all in one day do you?! This would seem a bit heavy going for the third cycle. It’s fine to take some days off before starting the next cycle of however many days. I’m wondering if you are counting the recent days as part of your third cycle and overcompensating for the days off by trying to do everything in one day, which is not something the authors recommend. To be honest that was more or less the idea… But it’s ‘only’ 470 exercises, not the entire set 🙂 . But indeed I was counting the recent days as part of my first cycle. Obviously I didn’t read the introduction well enough! So I’ll start coming Friday, and then I’ll take a week to complete my set 🙂 . Thanks a lot for your help! You’re welcome! Hans and Axel suggest taking anything from 1-7 days as a break in between cycles, so there’s no need to squeeze the entire set into one day at this early stage. Better to space your third cycle across 7 days (or maybe 6 if you can comfortably manage this) and only attempt the full set in a day after steadily increasing your speed by working through the cycles as directed in the book. It’s a bit like an athlete training for a marathon or similar. Most runners will gradually increase their training intensity with a view to peaking on race day. In Woodpecker training, the final day attempting the full set of exercises is our ‘race day’. We want to build up our ‘fitness’ steadily, rather than trying to run a full marathon in the middle of the training program. My results from Sunday will be revealed in tomorrow’s blog post. And yes, the authors mention this idea of revisiting the exercises roughly every six weeks, or before an important tournament. As far as I understand it, the exact timing of the follow-up solving is not so important, but I can imagine there are some benefits in terms of reinforcing the gains which have been made.